Edited again: The adhesive I use with fine glitter is a two way glue pen from Stampin' Up!. Edited to add: To answer a few questions-Yes, the card is stitched shut to form a pocket. The card does not open up, the inserts simply slip into the pocket. Yes, the stitching shows on the back. I usually don't like to see stitching exposed but I'm gonna live with it this time. The tiny buttons are about 1/4" diameter and I got them in one of those clear bags of buttons from Foofala, the best deal on buttons!! They run about $6 bucks and I find a good assortment at Archiver's. I stick them on with glue dots. Thank you all for the wonderful comments, I SOOO enjoy reading them. It's challenge time at Papertrey Ink! This month, Nichole challenged Design Team members to create a Christmas/Holiday card that incorporates photos. 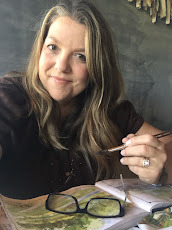 Check out Nichole's blog HERE for more information. I was up to the challenge and took it one step further......I finished all of my Christmas cards!!! (Well, 90% complete...I ran out of Kraft card stock so I'll need to finish up the inserts later). It's not even October......I have my Christmas cards done!! Woohoo, write THAT in your journal (that's what I tell Eric when I want him to remember something!). Once I got started I couldn't stop! The thought of getting my Christmas cards done early made me so excited. And to think that there's a photo and a little family letter is even better! Do you include photos in your Christmas cards? How about livening it up this year? Instead of just slipping the photo in the card, incorporate your photo into the actual card design. I chose to make pocket cards to hold my photos this year. I dearly love a pocket card! Here's what my design looks like below, complete with decorated envelopes ANNNND matching address labels. Can you believe I did it all? For the address labels, I used Papertrey's address labels. I just printed off my label sheet and added a matching snowflake to coordinate with the rest of my ensemble. Josey stamped the snowflakes onto the labels for me. Here's a closer view of the completed pocket card. I simply added some patterned paper to my folded pocket and stitched around three sides to make the pocket. All Kraft card stock edges are inked with white ink. Here's what the insert looks like. A photo of our family adhered to Kraft card stock. I corner rounded one corner. Note: This isn't a current photo of our family. As much as I tried to organize a photo shoot for a Christmas photo, the timing just didn't work out. So I'll have to update my actual cards this year with a current photo. Besides, Eric would faint if I asked him to light a fire with near 80 degree temperatures! Oh but wait, there's more! I added a second piece of Kraft card stock to my pocket insert. This is the same size as the photo insert, and I attached the two together with a brad. This allows the two pieces to swivel. LOVE it!! I printed my insert with *Happy Holidays from the Woodersons* then added some 2008 Family Highlights for each family member. Font is AFL Postmaster. 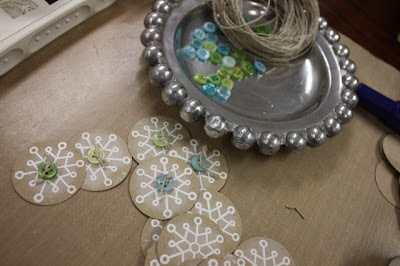 Okay, you wanna see some behind the scenes action on how to make the embellishments? I got out all of my supplies and matched up my papers and ribbons, etc. 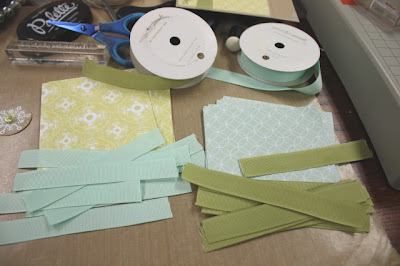 I used Papertrey's Everyday Blessings patterned paper, Spring Moss and Aqua Mist Grosgrain ribbon. I love seeing everything all piled up, ready for mass production. I wanted my cards to have some beautiful embellishments but I didn't want to spend hours and hours mass producing twenty-some Christmas cards. A stamper can only take so much mass producing right? And I know a lot of you probably make double or triple what I make! So I decided to stick to one fancy embellishment and then keep the rest very simple. 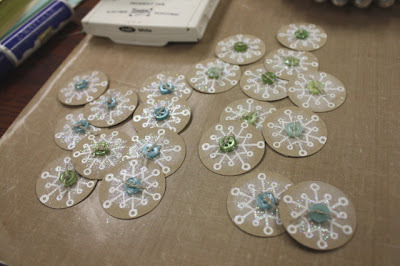 I started out by stamping snowflakes from Pine's Rustic Snowflakes onto Kraft circles that I punched out. 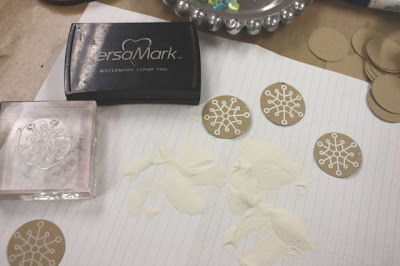 I embossed the snowflakes using VersaMark embossing ink and white embossing powder. 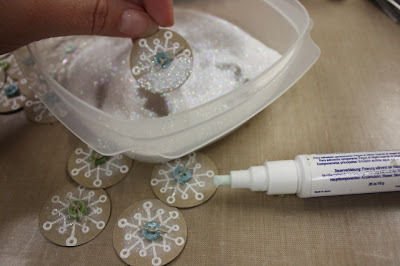 I wanted my snowflakes to have a soft feel to them so I used one of those finger dauber spongy things and white ink to soften the centers of my white snowflakes. Then I glitterfied the snowflakes with some SU! Dazzling Diamonds glitter. Love that stuff!! Aren't they so pretty and glittery? 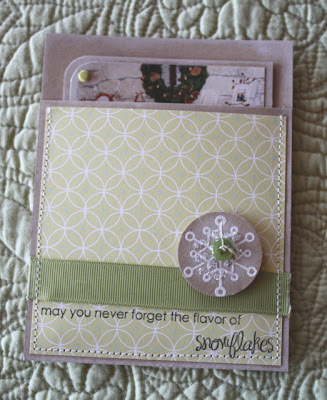 I then added my snowflakes to my pocket card fronts. 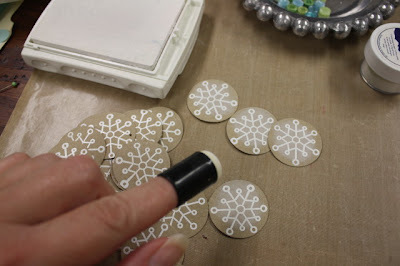 My finishing touch was stamping the fun sentiment from the Rustic Snowflakes set with black ink. It reads *may you never forget the flavor of snowflakes*. I love how Pine designed the word *snowflakes* with a different font. So cute!! I hope I have inspired you to get a head start on your Christmas cards! I'm nearly giddy that I have mine almost done!! Have I said that yet? 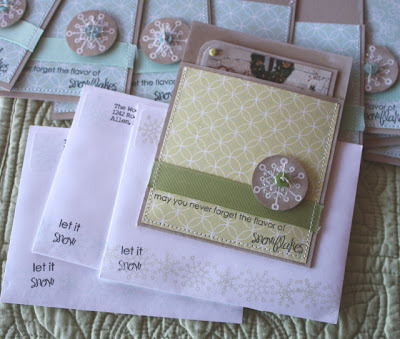 Be sure to check out all of the other Papertrey Design Team Members' blogs. 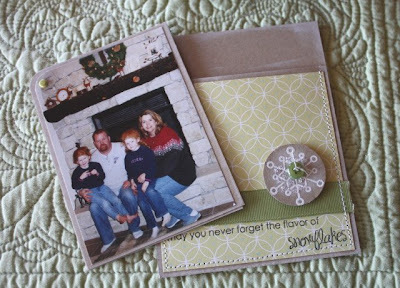 They each have made a photo Christmas/Holiday card so you'll have plenty of ideas to get you started. Beautiful card! Love the extra sparkle! Mish, I love them--great job! These are GREAT! I am absolutely doing this for my holiday cards. Thank you so much for the inspiration! Gorgeous cards! I actually finished my Christmas cards back in July. I was off work for surgery and really couldn't do much else. I usually start them in November!!! fantastic idea! love the little details you added to the card. You have been busy. I like what you made. Itlooks great. You inspire me to get my Christmas cards done too (write that in your journal - ha)! Anybody would be delighted to receive this cute card and picture combo - good job Mish! Wonderful idea!! I can actually see myself making these this year! I love the photo and update attached together with a brad. You have definitely inspired me! Wow! Have you been busy! You are such a great inspiration! I love your cards - you have a beautiful family. I was thinking of doing a pocket card this year and you've just sealed the deal for me! These are beautiful! Lovely detail! Is it any wonder I am a frequent BLOG STALKER of yours! I love these - they are awesome! 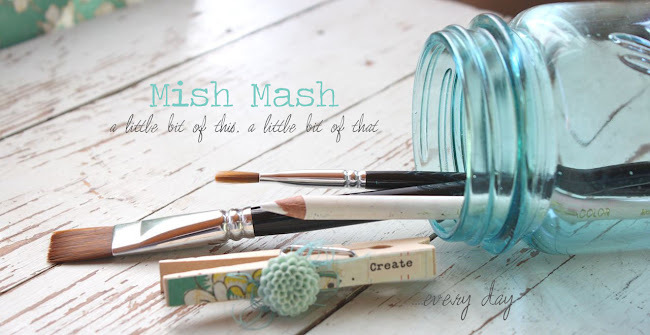 These are super cute, Mish! 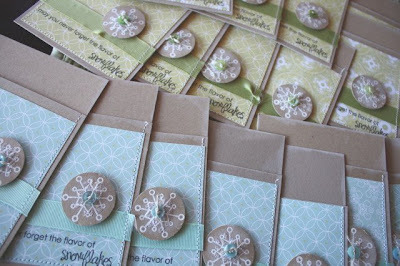 What a great idea for Christmas cards! Oh my these are awesome. and congrats on finishing them all so early. :) Couple of questions: does this card open or is it just the pocket? and is the sewing all the way through so you see it on the back? I really love this and think I will do something similar for my cards this year. Shut up...you have your Christmas cards done already! You rock girl! I still haven't finished my Christmas cards from last year! lol I love all the little details that you never leave out! Great cards! okay another question for you. Those buttons look tiny, where did you get them from? Hoohaa! I thought I was doing well this afternoon finishing 10 cards alike. These are wonderful, Michelle, and will be loved! Michelle-these are beautiful. What was the adhesive you used for your glitter application? These are Fabulous! Good on you for getting them completed so early - I am giddy with just seeing them!! I love your what you did. I love the stitching and the photo insert. I've done photo-based Christmas cards for the last 5 years, and you are sparking some creativity for a new way to do things. Thanks for the inspiration! What a great idea! These turned out awesome! Love it Michelle. And I am so jealous that your cards are almost done....mine haven't even gotten started yet!! But you might have inspired me to get a move on!! Gorgeous and good for you! Look at that productivity...Hugs! Lucky you to have your cards done (almost). They are really cute. Thank you for showing up step-by-step, I love it when you do that!! Thanks so much for answering my questions. You're a sweetheart! As usual, adorable, adorable, adorable!! I'm usually finishing up my cards around December 23rd so I'm in awe you're so far ahead of the game. I'm going on a stamping weekend with some friends in about 3 weeks and plan on getting them done early this year for a change. Thanks for the great idea. Anyone would be happy to find this sweet card in their mailbox. This is a brillant idea and I think I will be using for my own xmas cards this year! 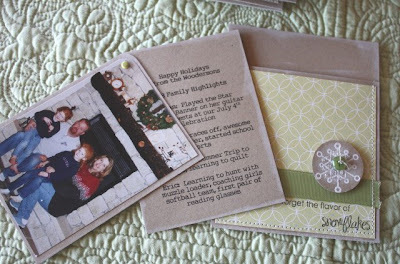 I love how it incorporates everything...a stamped image, a pocket, the pic, and a xmas 'note'. I usually don't like just xmas pic cards, because then I miss the stamped image. Great job! 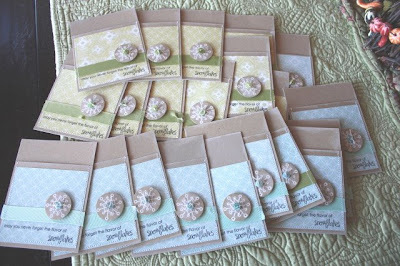 Love these pretty cards - great photo and note insert! Oh my, I love this idea! Fabulous! Mish, you did it again! Everything you make is so great!!! You were the Runner Up Photo Card of the Week at Card of the Week.com. You can see the original post here. I did use a picture from your post, with links back to the site and the original post. I hope that is OK. Please feel free to email me if you need me to change anything. What a wonderful idea!! These are absolutely beautiful!!!! You are SO on the ball! I love them! I have made some but I am no were near done.